Switching - or class D - amplifiers, even if they are yet to overthrow their analogue equivalents, are nonetheless of some interest by virtue of the significant power they are able to produce with their compact form without losing much energy, thanks to their excellent efficiency. All of these advantages, as well as the high sound quality of the amplification modules, have enabled Pro-Ject to create the Stereo Box RS - compact, powerful and boasting great sound results. Alongside the numerous turntables that have made it famous, the Austrian manufacturer Pro-Ject also offers several series of electronics grouped under the generic term 'Box Design'. Altogether this includes dozens of devices such as analogue-to-digital converters, phono preamps, CD-players, network drives, pre-amplifiers and amplifiers. In short, almost anything Hi-Fi can be found at Pro-ject for a small or at least reasonable budget, even in the RS Line which includes the more high-end products. This series, made with particular care (aluminum housing with a very solid front), includes the DAC Box RS (which we have previously tested in our Hi-Fi Guide), the CD Box RS, the Stream Box RS network drive, the Pre Box RS Digital preamp, and the Stereo Box RS integrated amp. It has recently been expanded to include the product we are putting to the test right here. Supplied with a switching power supply mounted in a separate enclosure, the Stereo Box RS, mixing tube input stage and switching amplification, can deliver 2 x 80W/8Ω, amounting to 2 x 120W with 4Ω speakers. 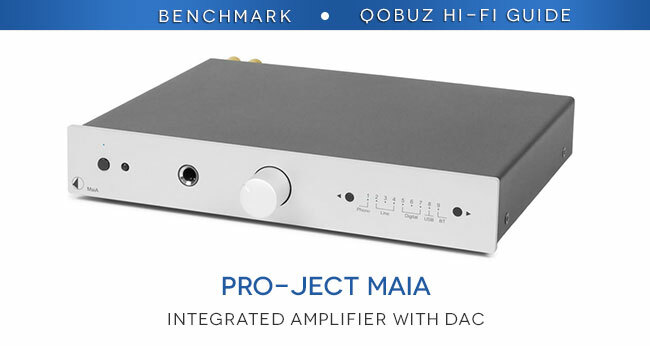 The power, which already works well, can go up to 2 x 100W/8Ω and 2 x 195W/4Ω when using the optional proposed linear power supply from Pro-Ject, the Power Amp Box RS. Whilst this will certainly increases the bill, it is still quite acceptable considering that we have a particularly powerful amplifier that can even, according to the manufacturer, be used with 1Ω impedance, with four 4Ω speakers in parallel at each output. The presentation of the Pro-Ject Stereo Box RS can be described in three words: Sober, Serious, Solid. Made entirely out of aluminium, the solid and pleasant-looking outer case has a front panel measuring a respectable 10mm thick. On the left side of the front, a small toggle switches the device on and off. Above this is a discreet blue LED which blinks during electronic stabilisation (more particularly, as the temperature of the tubes rises), then remains stable. Next to this is the receiver for infrared remote control signals. In the middle of the front panel is the manual volume knob which is set back in a recess. There are then six small LEDs corresponding to the inputs and the switch for source selection, with two positions for ascending or descending scanning. 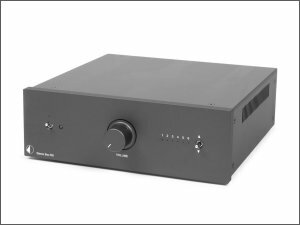 With six stereo analogue inputs (five asymmetrical Cinch and one symmetrical XLR jack), the Stereo Box RS can cope with the needs of audiophiles already well-equipped with analogue sources, but has no capacity to connect to a turntable without inserting a phono preamp (which Pro-Ject already sell) between it and the amplifier. There are also two stereo outputs on RCA jacks; one at a fixed level which can be used to connect a recorder, while the other, with a variable level which is controlled by the volume knob, can (if the need arises) feed a more powerful amplifier. 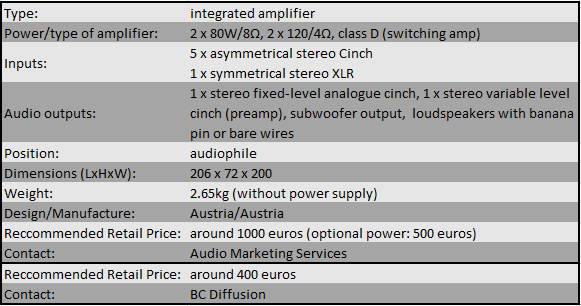 The amplifier also has a subwoofer output, and its power supply, located in an outer casing containing a standard switching model or an optional more sophisticated and powerful linear model, connects via a three-pin locking plug. Finally, the terminals for the speakers are great models which can accommodate either bare wires or banana plugs. 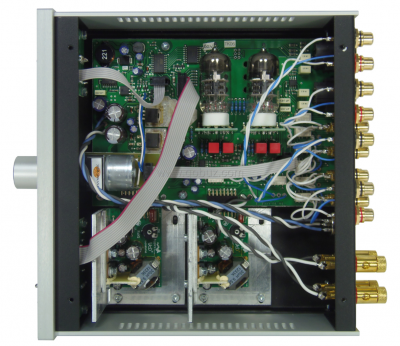 The housing of the Stereo Box RS amplifier is somewhat elaborate as the internal frame is made of multiple folds of a solid steel plate forming the back, bottom and front interior. This case is coated, as is seen in other high-end devices, by aluminum measuring 3mm thick on the sides and top side and 10 mm thick on the front. The electronics are consistent with Pro-Ject with well-made cards connected by a network of wires similar to those seen in computer circuitry. 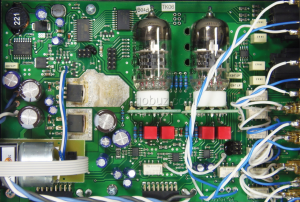 On the main board we find the source switching relay, controlled by a ULN2003 circuit (top, left tube) and the Electro-Harmonix 6922EH tubes that serve as buffer for entries. High-performance Burr-Brown OPA2134 operational amplifiers used as a gain stage and circuits of the same type are used to create the phase inversion signals to symmetrical outputs and active filtering for the subwoofer output. In the left part of the photo you can see the motorised potentiometer manufactured by Alps; its control circuit is a L4971D by STMicroelectronics (top left of the photo). 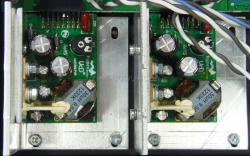 Just above the potentiometer are 470μF/63V capacitors with power supplies which are then regulated to + 16V and -14V by MosFet International Rectifier IRF9530 and IRL530NS transistors, in order to supply the operational amplifiers. An Atmel ATtiny2313 microcontroller (second upper circuit from left) is responsible for managing all of the electronics. These modules also benefit from protection against overcurrent and the presence of a DC voltage output and can operate on charges of 2Ω or 1Ω if the power is sized accordingly (as with the optional linear power supply to the Stereo Box RS). Although normally we cannot resist taking a look inside devices that pass ino our hands before anything else, with the Stereo Box RS we tested it with our ears before our eyes; ears this amplifier quickly seduced. So when we found out that the power amplifiers were switching models by Hypex, it was not exactly a shock, but a surprise and also a confirmation that this type of amplification could in fact be very musical - which is not always the case. We started listening to the Offertorium from Dvorak's Requiem in Antoni Wit's beautiful interpretation with the Warsaw Choir and Philharmonic Orchestra. The restitution of the Pro-Ject amplifier is of a high quality, creating a lovely soundscape which gives the soloists and choirs a fluidity which builds an ambient sense of quasi-religious intensity. We would have believed we were listening to an analogue amplifier. The restitution was equally strong when listening to the superb album Vivaldi: Vespri per l'Assunzione di Maria Vergine by Rinaldo Alessandrini leading the Concerto Italiano, where the Stereo Box RS demonstrated with liveliness and finesse the sudden stabs of strings whilst not getting too cluttered during complex passages. The restitution remains clear when pushing up the volume - which really shoots up in decibels on this amplifier! With the song Chaleur Humaine, from the album of the same name by Christine and the Queens, we noticed the strength and scale of the lower range of the amplifier which managed to maintain the warmth of the singer's voice in a rather sumptuous overall soundscape. We finished with a bright and full restitution in the higher register, which was well built with strong bass notes, in the song The Sun Is Gonna Rise Again from the album Where I Belong by Chris Cab. In conclusion, this compact amplifier is powerful, with a very good quality of manufacturing which can further evolve to provide powers with increasing ease, and offers excellent sound results. Thanks to its six analogue inputs, it is sure to satisfy amateurs with many such sources - amongst others.